Team building is a focused approach which aims to enhance the team spirit and the productivity of an organisation. As of today, it is one of the necessary skill set. All the institutions and organisations have realised the need to develop team spirit. Perfect blends of outdoor and indoor activities are being actively deployed. The team building activities result in improved communication, self-confidence and mutual cooperation. The workforces get a better chance to know each other and the learning process is simplified. They realise the need to put concrete efforts for an all-round development. Improved decision making and adjusting to the changes of the corporate environment is the fruitful effect of the team building strategy. A decoction of Fragrance: This activity includes asking the contestants to prepare fragrant aromas. The activity may have more than 10 participants and the time allocated in between 30 minutes up to two hours. You need to experiment with different flowers and exotic extracts to make out a perfect fragrance. You can explore all the basics of the perfumery and learn all about the top, middle and the lower notes. Compete the timer: Designed for a team of more than 10, this game aims to teach the people the art of time management. It has a blend of different mental, physical, general awareness and creative games. The game aims to boost the time management skills with vigorous outputs. Trade on Technology: A digital fun game which aims to inculcate the values of planning, managing and cooperation among the employees. The game takes time duration of 2-4 hours and uses the contemporary technology such as audio-visual aids, DSLR cameras, animations and monitors. The basic concept revolves around creating imaginative stories with the team members. Sightless Drawing: This is an interesting game. One of the team members will be provided an illustration and the other member will be handed a pen and a paper. The one with the picture will illustrate the picture to his friend. The other member is expected to draw the image as per the instruction of this team member. The sightless drawing aims to boost the concentration and communication power of the individuals. The Flawless Square: All the team members will arrange themselves in a circle and then veil their eyes. Next, a rope is provided to all the team members. They must have a strong grip of the rope and then arrange themselves to form a proper square. After the team has finished making the square, they must unveil their eyes and check the square they have formed. The game develops leadership skills and mutual trust and cooperation among the individuals. Hunting for Shared Interests: Divide the people into a team and ask them to look out for common interests among their fellows. Doing so shall boost the feeling of oneness. 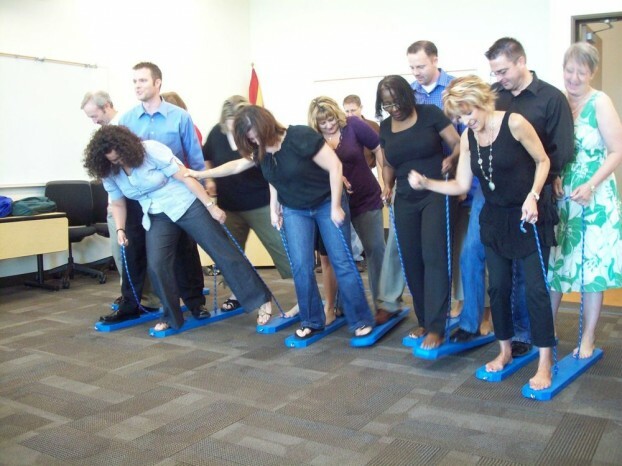 All these indoor team building activities would work as wonder to build a strong collaboration among the workforces, thereby stimulating overall progress. Next story Acting Secrets For A Successful Career!